Would you like to have surround sound around for your PC? Then it’s time to experience the new PC theater system SW-5.1 1020 from Genius. It has a 4-inch driver in wood cabinet to bring you beating bass. 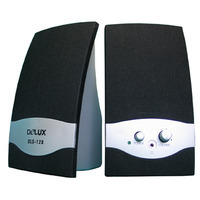 Five piano-black satellite speakers each use a 2.5inch driver to deliver balance and rich sound detail. 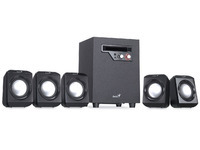 SW-5.1 1020 lets you enjoy 5.1 channel sound with your favorite PC movies, games, or music. 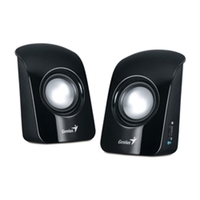 The SW-5.1 1020 delivers a total of 26 watts (RMS) audio output. Three color-coded 3.5mm input jacks make it easy to connect to a PC 5.1ch sound card. Also, you can connect the green 3.5mm jack to other stereo devices, such as a notebook, iPod, or MP3/CD player. The power, volume and bass controls are on the subwoofer and a headphone jack in on the front panel for private listening. 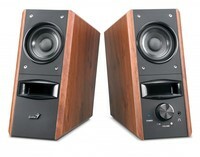 So pick up the SW-5.1 1020 to hear great sound around you.